Using just a handful of ingredients these crunchy, tasty, pumpkin seeds are simple to bake and sure to please. 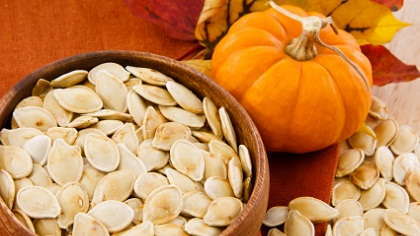 Your little goblins will have fun making these crunchy, tasty, pumpkin seeds from their freshly carved pumpkin this year. Spray a cooking sheet with olive oil spray or line tray with parchment paper. Lay seeds in a single layer and spray with olive oil spray. Sprinkle with sea salt and Season All. Bake for approximately 20 minutes until dry and crispy, turning once to crisp on both sides.